I've received many inquires asking "... am I allowed to use US Military Campgrounds?" These are usually from veterans who served a few years and have an honorable discharge. Sometimes it's from a retired civil service employee who worked for the Army, Navy, or USAF for 30+ years. And some of the inquires are from veterans who are 100% disabled. There's also been a lot of discussion on the various news groups about the 100% DAV authorized use issue. I attempted to do a little research and clear all of these issues up. The following are my findings. 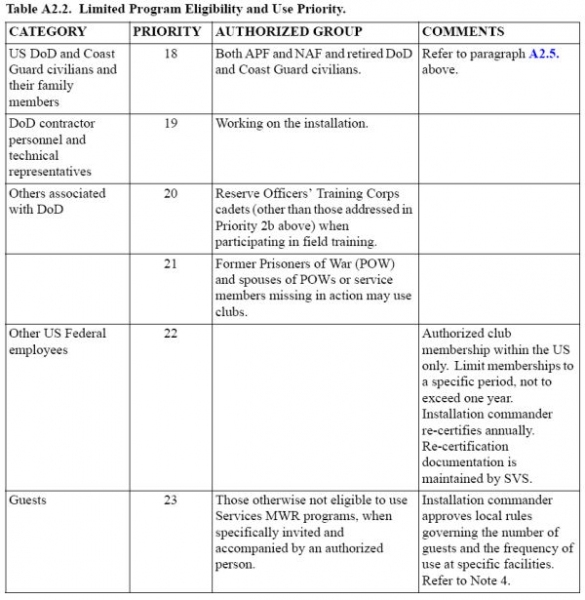 In a nut shell, 100%DAV is authorized at all US Military Campgrounds. 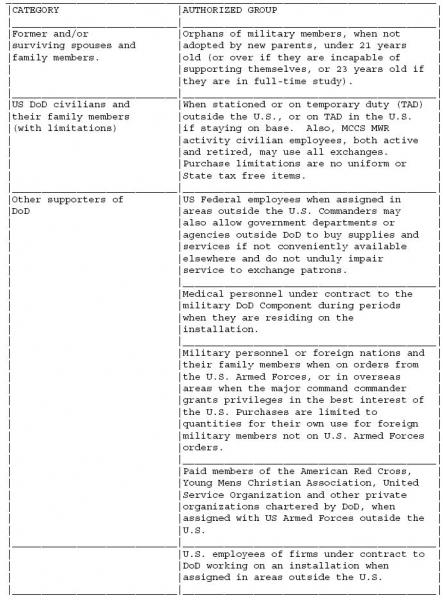 Being an honorably discharged vet is not authorized, unless there is another circumstance that does authorize the veteran (retired, 100%DAV, etc). As with many issues when dealing with the government and the military, you're bound to get a variety of answers. 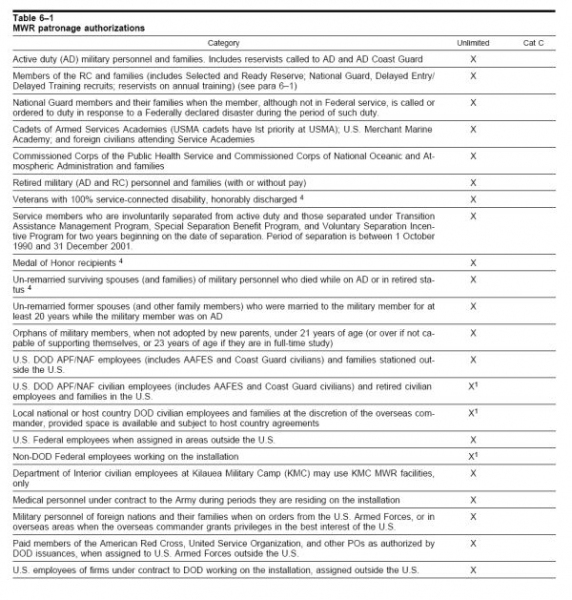 I discovered the lists of authorized users that's published by the various military campgrounds greatly vary, are not the final word, are interpreted differently by campground employees, and most importantly, are not complete. 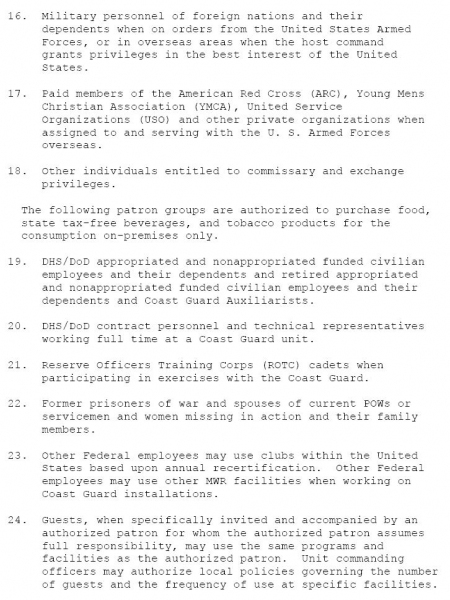 Each military campground is (somewhat) independently ran and seems to establish their own list of authorized users. The Installation Commander usually has the final approval of who they allow to use "their" campground. If you can get past all of the personal opinions, the list of authorized users is actually regulated. 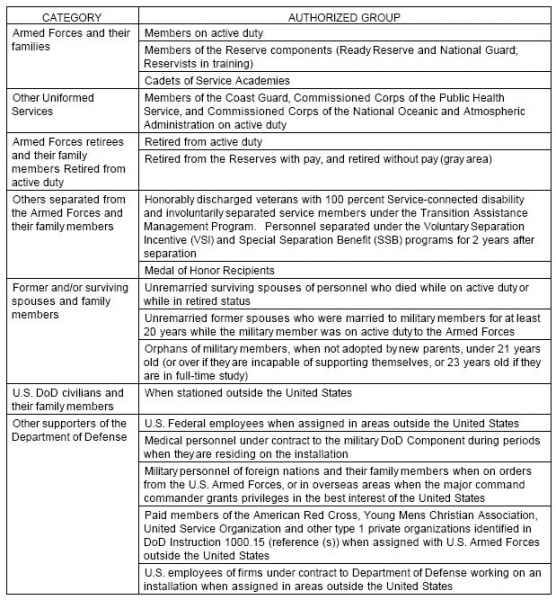 Each of the military branches have a regulation listing who is an authorized user of MWR activities, which includes Outdoor Recreation facilities. 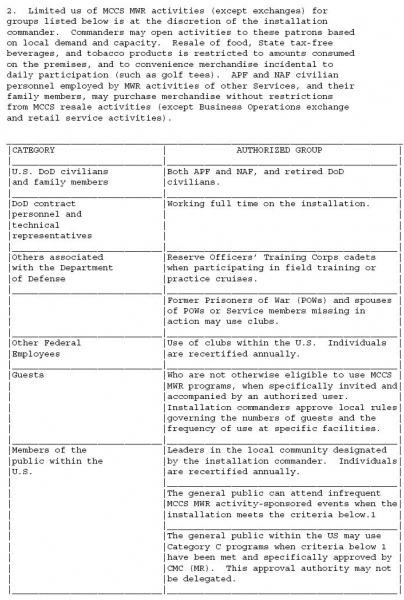 The Department of Defense has established DOD Instruction 1015.10, dated 31 Oct 96. 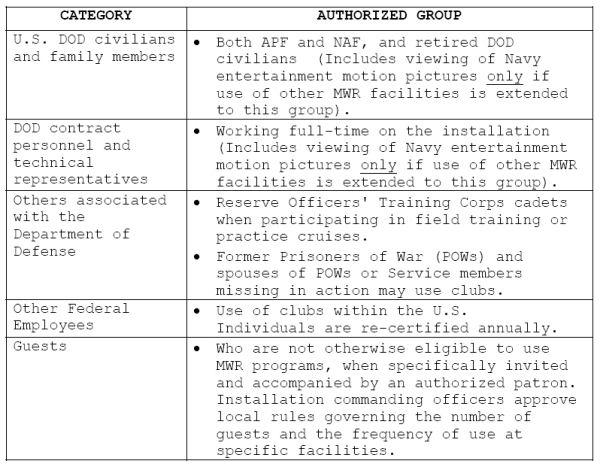 Enclosure 3 details Authorized Patronage of Military MWR Programs. While all services frollow this Instruction, they've also written their own to cover seperate regulations. 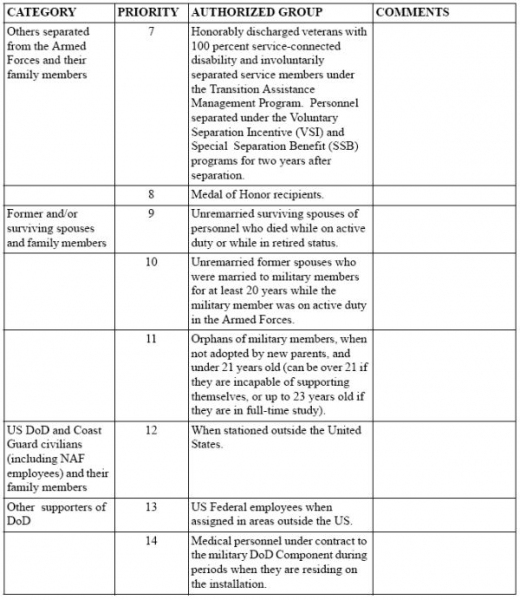 For the Army, it's Army Regulation 215-1. My references are from AR215-1, dated 15 Aug 05. Paragraph 6-1b explains what identification is acceptable. I'm not going to quote the regulation to you, just parts of it. 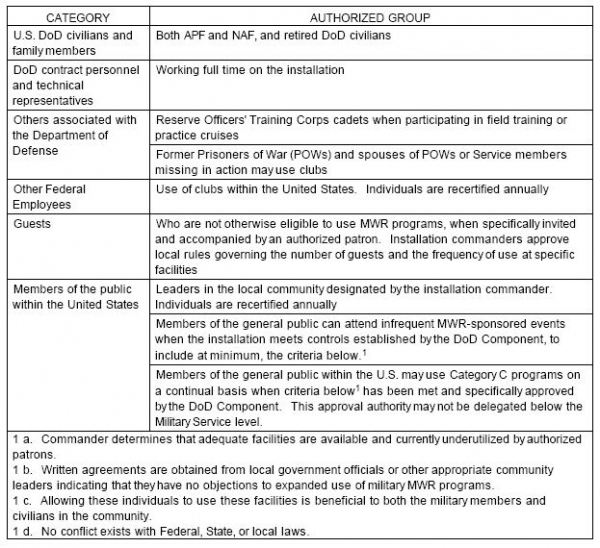 But be aware that Outdoor Recreation activities and campgrounds within the Army are classified as a category C MWR activity (Community supporting activity, revenue generating), which also means they get limited appropriated funding. This category rating also important in deciding who has priority. For the Army's category C MWR activities, Active duty receive first priority, if space is limited. 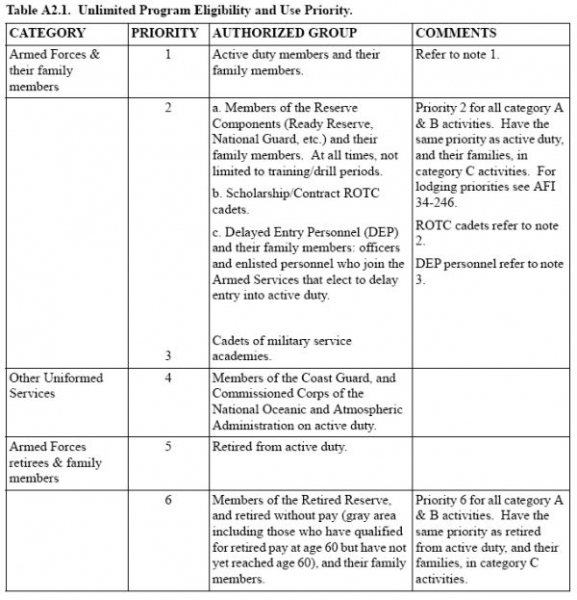 Ready and Selected Reserve members have the same priority as AD personnel with regard to category C activities. 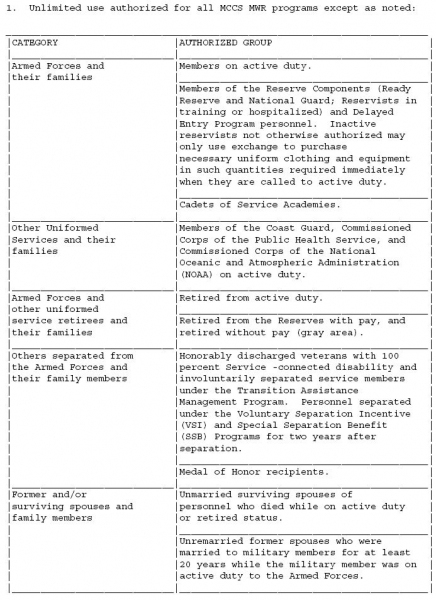 Reserve personnel don't have first priority on category A or B activities. For the Air Force, it's Air Force Instruction 34-262. My references are from AFI34-262, dated 27 Jun 02. 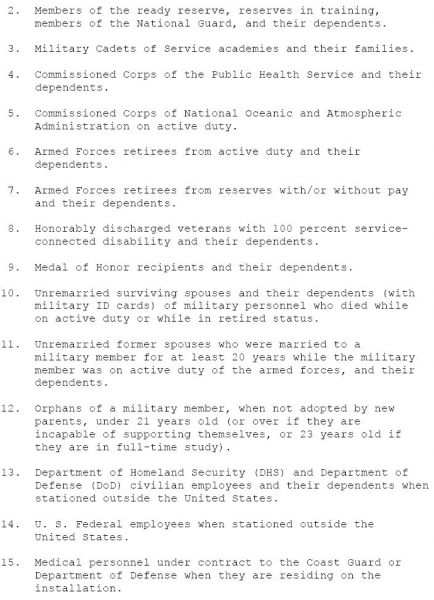 Chapter 3 explain services program eligibility, with Attachment 2 getting into details. 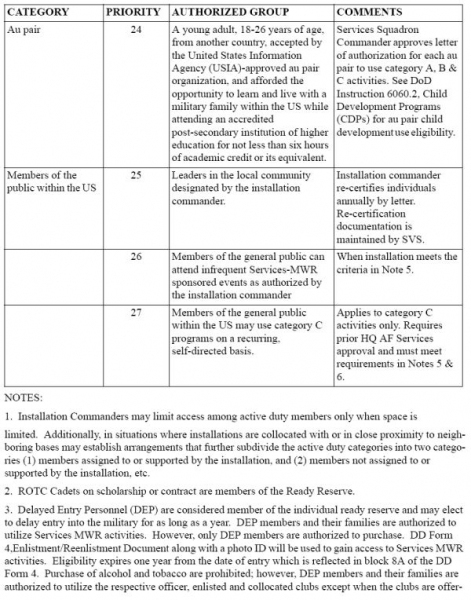 If there is limited availability of the service, the installation commander specifies the use priorities, based on the listings in Table A2.1 and table A2.2. Table A2.1 lists the Unlimited Program Eligibility and Priority, while table A2.2 lists Limited Program Eligibility and Priority. Patrons described in Table A2.2. 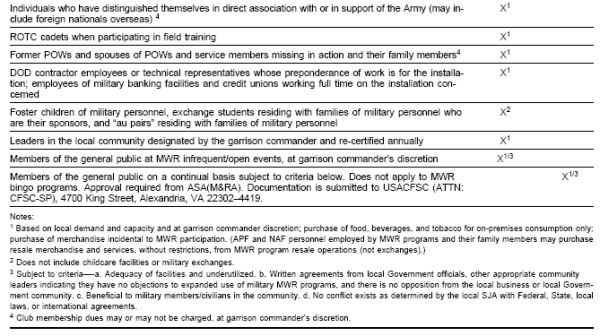 are authorized limited use of military Services MWR activities at the discretion of the installation commander. Commanders open activities to these patrons based on local demand and capacity. For the Navy, it's BUPERS Instruction 1710.11C. My references are from BUPERSINST 1710.11C, dated 25 Jul 01. Chapter 6 explains MWR program eligibility. 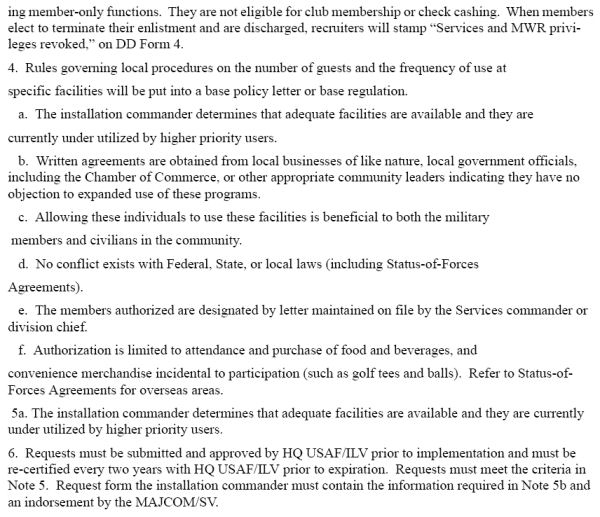 Paragraph 603 states "If MWR facilities cannot accommodate all authorized patrons, the commanding officer determines specific use priorities." 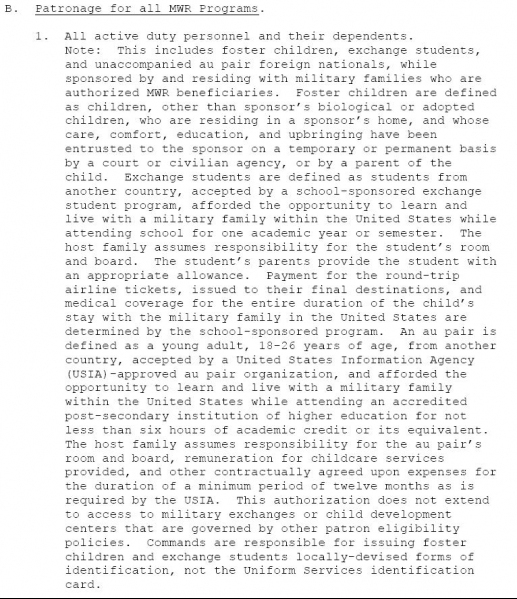 Paragraph 604 has a chart showing Unlimited Use of MWR Programs. 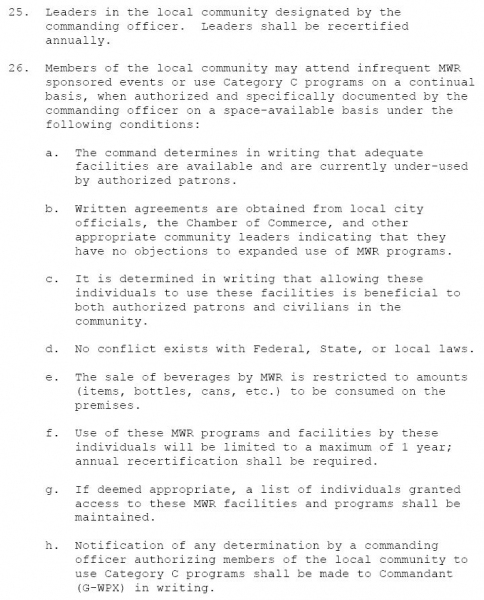 Paragraph 605 explains Limited Use of MWR Programs. Commanding officers have the discretion of allowing or disallowing use of MWR facilities based on space and availability. For the Marine Corps, it's Marine Corps Order P1700.27A, dated 8 Nov 99. Paragraph 1201 lists Eligible users. 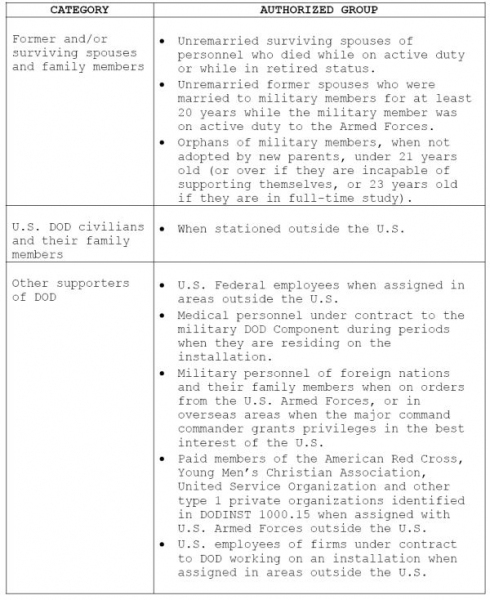 In conclusion, as stated at the beginning of this article, rules of who is authorized to use military campgrounds can be confusing. 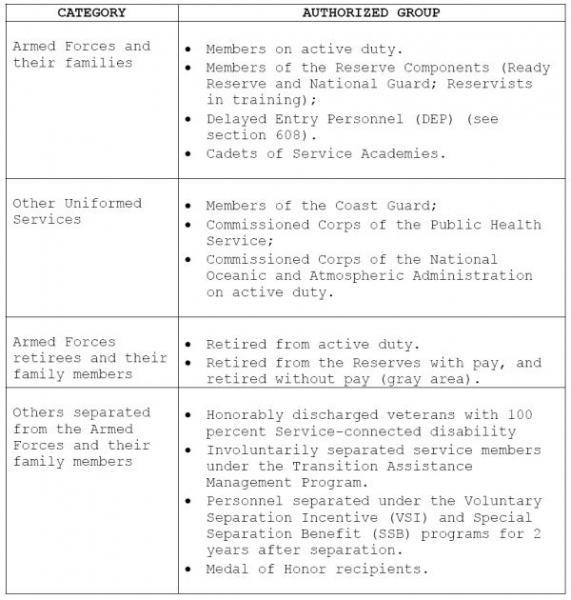 Based on the references provided, there is basic eligibility for Active duty, Reserves, Retired, and 100%DAV. 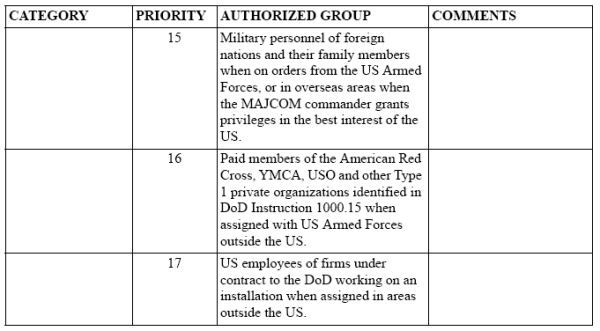 But there are also many other categories that "may" be authorized, based on the installation commanders discretion. Since each campground could have different local regulations or amendments, it's best to call the campground directly for any of these "gray" categories of limited use. Disclaimer: The above information is NOT OFFICIAL. It is based upon my personal experiences and research.